Democrat Jon Ossoff continues to bring in an overwhelming majority of his fundraising haul from outside of Georgia, with 97.5 percent of the contributions his campaign received over the past two months coming from donors in other states, according to a newly released campaign filing. The filing, covering donations received from March 30 through May 30, shows that only 2,158, or 2.5 percent, of the 86,313 individual contributions the campaign received were from Georgians. 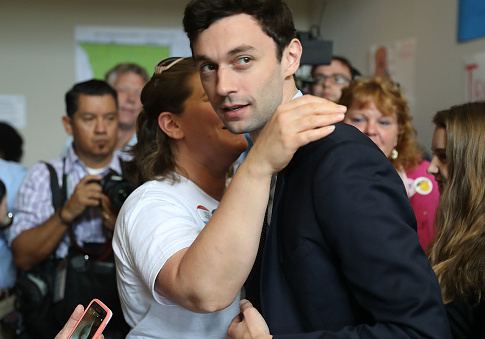 A smaller percentage of those Georgia donations came from donors within the Sixth Congressional District that Ossoff is running to represent. The share of out-of-state donors in the filing is a slight increase from the campaign's previous filings, which revealed that 95 percent of Ossoff's contributions were from outside Georgia. Ossoff has now received 96.6 percent of individual contributions from out of state over the course of his campaign. The leading source of contributions for Ossoff during April and May was California, where 20,251 contributions originated. An additional 11,251 came from New York. The share of money that Ossoff received from Georgia in the two-month span, $536,039, accounts for about 10 percent of the money he raised through individual contributions. Ossoff was confronted about the amount of money he receives from outside of Georgia during a debate on Tuesday night. "It has been widely reported that there has been more money spent on this House race than any other in American history, and the bulk of those dollars are not coming from the state of Georgia," the moderator said to Ossoff. "Is that wrong? What are your thoughts on that?" Ossoff responded by saying "it's a major problem" and that "there's far too much money in politics." Republicans have attempted to tie Ossoff, who is unable to vote in the election because he doesn't live in the district, to California liberals such as House minority leader Nancy Pelosi. The latest ad from the National Republican Congressional Committee labels Ossoff as a "childish radical" who would "represent Nancy Pelosi" in Congress. Ossoff will face off against Republican Karen Handel, Georgia's former secretary of state, in a runoff election on June 20. His campaign did not respond to a request for comment on the new filing. UPDATE, Monday 11:30 a.m.: A previous version of this story stated that Ossoff raised $1.1 million in individual contributions from Georgia from March 30 to May 31. He actually raised only $536,039. This entry was posted in Politics and tagged Georgia, House of Representatives, Jon Ossoff. Bookmark the permalink.